Whether you ride competitively or out on the trail, fear can hold you back from being the rider that your horse needs you to be. Even the smallest amount of fear can rob you of the joy you deserve in the saddle as well as hold you back from progressing to the next level of horsemanship. Join Fear Specialist, Heidi McLaughlin, at a 3-Day “K.I.C.K. Your Fear” Clinic and learn new concepts to help with your confidence issues. At these clinics, students are taken through a process to identify and break down their fear and then use Fearless Riding techniques to build up their confidence. At each clinic, students will receive a doable 90-day plan to take home with them which easy to follow instructions of the Fearless Riding techniques, allowing them to continue their progress at home. "Hey, Heidi. I just wanted to let you know, I cantered my 3 year old for the first time by myself (without the trainer) this past Sunday. It felt marvelous! Thanks for all the encouragement. It really helped." Heidi is an expert with the human side of fear and works to move students past their fears to begin their journey into fearless horsemanship! Since Heidi is not a horse trainer, students will need to bring a well-trained horse that they can trust. 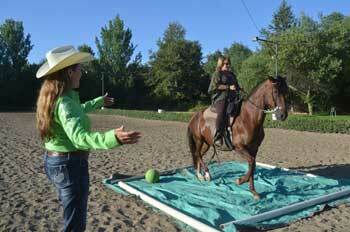 Heidi uses the horse as a tool to help the student to overcome their fears but does not train the horse. Please DO NOT bring a green, unruly, or adopted horse with issues as this type of horse will not help you to get over your fear and is not suitable for this type of clinic.